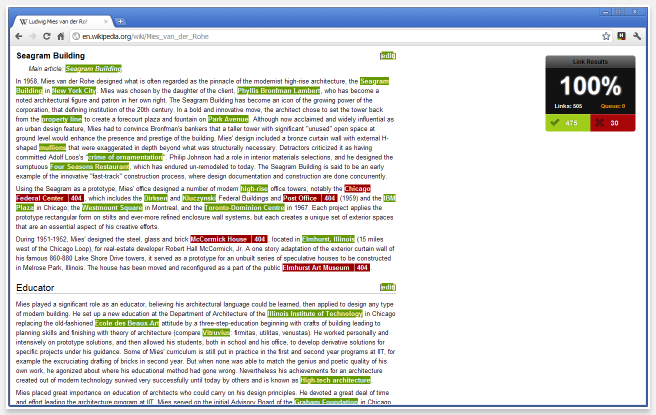 This is the third in a series of posts focusing on how I use BuzzStream to build links. See the previous two posts on infographic link building and guest post link building to catchup on these techniques. In general, there aren’t many “quick win” link building techniques out there which delivery good quality links. Most high quality links take time and effort to get, however this technique can get you good quality links without the need to spend tons of time on it. There is still a catch though, the same rules of link building apply – you need a site that deserves links. Having a site that deserves links is a post for another day, let’s focus on the process of broken link building using BuzzStream. Essentially with broken link building, we’re looking for that “hook” or “way in” to a link prospect. Approaching link prospects can be hard because you need to give them a good reason to link to you. When you tell them that they have broken links on their site, you are doing just that. There are a couple of ways of finding broken links. I have to admit that I very rarely actively go looking for them, most of the time I’ll be looking for potential link opportunities and just happen to spot broken links. If I do, I’ll take advantage and use that as my hook or at least part of the hook. For this reason, I rarely approach a website owner asking them to replace a broken link with my own, I’ll simply ask them to add my link and inform them of the broken links that need fixing. 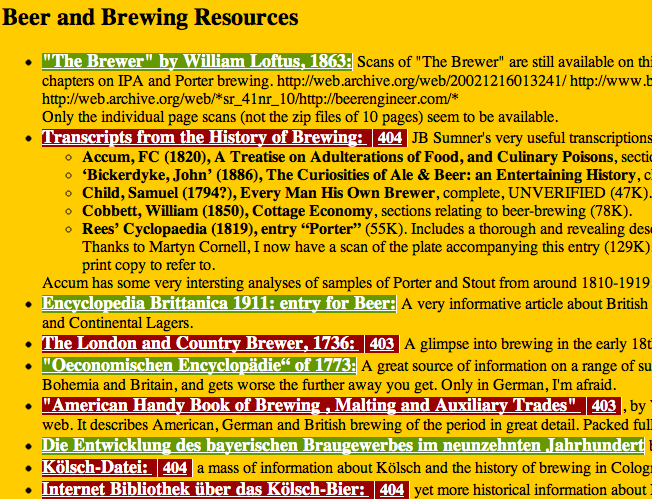 If I was running a beer selling website online, this is the perfect type of site for me to approach. Something to be aware of here is that sometimes, 403 errors can be wrong. Some websites will sometimes block automatic requests from sources they don’t know or trust. So you just need to be careful and actually check the link yourself. Next up we’re going to use the trusty BuzzMarker to get this prospect into BuzzStream. 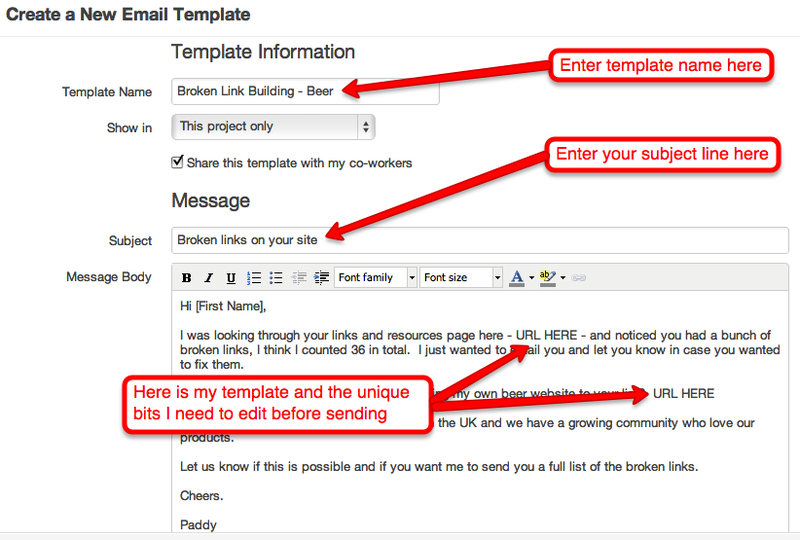 I also tend to create a new project within BuzzStream called “Broken Link Building” which this prospect will go into. We’ll come back to how we’ll use this information later. For now, you just need to keep doing prospecting and adding contacts to BuzzStream. Something to note here, you’ll still want to do some due diligence on the site and try to work out if it has updated recently. There is a chance that the website has been neglected for a while which is why it has broken links. So I tend to look for signs of activity such as an updated blog or news section. The one thing I love about BuzzStream is that it allows you to scale outreach without being spammy. The outreach module makes it super easy to send lots of emails quickly whilst having the ability to edit them individually if needed. Click send and you’re done! You can imagine how quickly this can scale and how many of these emails you can send in an hour or two. I have yet to play around with BuzzStream but it looks like it would be highly beneficial during outreach. I really appreciate you linking to my SEOmoz post on the subject. I don’t always ‘set out to do broken link building’ but when I am checking out link prospects, I always run the Chrome plug-in to see if there are any. It can be a nice value add to any outreach email. Great tips Paddy. Loving your work at the moment 🙂 I feel this may work well for the ‘one man band’ type blogger who is looking to gain link love from fellow bloggers in his niche. For example: Lifestyle design bloggers notoriously link to one another as do Graphics design bloggers. Think if your an inspiring blogger and come across this post you can make some real quick wins with the niche you are trying to enter. I’m going to use this both in work and on my own gig. Excellent idea, never thought of using this approach to link building. Will check if that plugin exists for Firefox too. Cheers! Thanks for the tips here Paddy. I am going to take a close look now at what Buzzstream can do bow to help my linkbuilding. Paddy, have you tried http://www.brokenlinkbuilding.com/? You just need to enter a keyword and you will receive related broken links. Great time saving tool. people. How did you find them? The free Chrome plugin you mentioned is incredibly helpful. Saves a TON of time and research.